37 great Valentine’s Day restaurant deals & freebies! If you are thinking of taking your sweetie out for Valentine’s Day, you aren’t alone. February 14 is the second most popular holiday for dining out. Mother’s Day, comes in as Number 1. According to the National Restaurant Association, about one-quarter of Americans say they are planning to dine out for Valentine’s Day. In a survey conducted by the group, one-third of the participants say they would prefer to get a gift card to any other Valentine’s Day gift. If you are one of the millions who will be heading out to eat on Thursday, here are a few Valentine’s Day meal specials to consider. Celebrate and save with these delicious Valentine’s Day deals! Enjoy buy one, get one free heart shaped pretzels with this coupon on Valentine’s Day. Enjoy a Sweetheart dinner and pie for two for $19.99 from February 14 through 16. This ice cream shop is offering a Love & Kisses sundae for just $5 at participating locations. You can get two Valentine’s meal with two starters and a shared dessert for $35 now through Valentine’s Day. Make a reservation online to get the deal! Enjoy $5 off a family meal with this coupon on Valentine’s Day. Enjoy a “Classic Love Package” which includes heart-shaped lasagna for $49.99 on Valentine’s Day. Look for deals on a “Sweet Deal for 2” menu available through February 17. Choose an appetizer, two entrées and a dessert for just $35. Now through February 17, enjoy a Valentine’s Day dinner for two starting at $45. The restaurant is offering a three-course Valentine’s dinner for two from now through February 17. 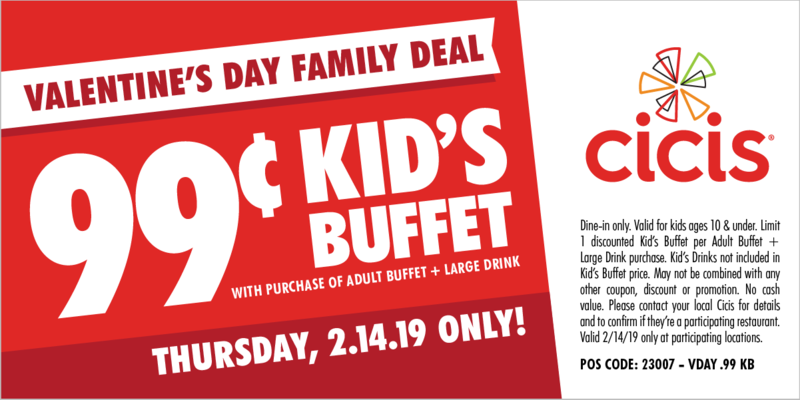 Use this coupon on February 14 for a $0.99 kids buffet with the purchase of an adult buffet and drink. Participating locations are offering two meat plates for two people for just 22. Try the Chili’s Grand Romance margarita for only $5 at participating locations all month long. 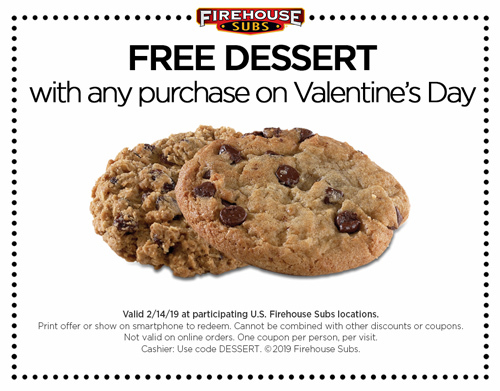 Get a free dessert with any purchase on Valentine’s Day when you show this coupon. Through February 18, Fleming’s is offering a three-course Valentine’s Day prix fixe menu for two starting at $70. Buy 10 and you’ll get 10 free chicken wings on Valentine’s Day during the restaurant’s “Shred Your Ex” promotion. This rebate app is offering a free glass of champagne worth up to $5 on February 13 and Valentine’s Day. Joe’s Crab Shack is offering a special Valentine’s Day prix fixe menu for $49 per couple. This deal is available February 14 through 17. The doughnut shop is going straight for the heart with three varieties of special Valentines-themed doughnuts: Cake Batter heart, Chocolate Kreme-filled, Strawberries & Kreme and Raspberry-filled. These are available at participating shops through February 14. Macaroni Grill is offering a special Valentine’s Day menu for two for $45. This deal is available through February 17. Maggiano’s is offering a carry-out deal for both couples and families this Valentine’s Day. Enjoy a meal for two with dessert for $50 or a family meal for four people for $60. Get a Cupid’s Special which includes two appetizers, two entrées and a sharable dessert for $29. Mimi’s is offering a $19.99 three-course dinner special for Valentine’s Day. Morton’s is offering a steak and lobster combo for $59. The Italian restaurant is offering a special to-go menu for two starting at $35.99. Get a four-course Aussie Celebration for two through February 17. Prices vary depending on location. Pizza Hut has a “Valentine Bundle” for $17.99 that includes a one-topping, heart-shaped pizza and your choice of dessert. Singles can enjoy a free cookie with their meal on Valentine’s Day. Wear pink to participating locations on February 13 and enjoy buy one, get one free cinnamon sugar pretzels. Enjoy buy one, get one free entrées when you kiss anyone or anything at Qdoba for its Qdoba for a Kiss promotion. Ruby Tuesday is offering a $15 bonus card for every $50 you spend in gift cards. Get a free mini Louisiana-style hot sauce with any order on Valentine’s Day. This restaurant is offering complimentary chocolate truffles on February 13. If you get engaged at Seasons 52 on Valentine’s Day you can enjoy free champagne at your table for a year. Enjoy Valentine’s Day dinner for two for only $24.99 at Shoney’s. For a limited time, enjoy 20% off orders of $20 or more when you order online. Enjoy half off bottles of wine through February 19 at participating locations. You can make reservations for Valentine’s Day at the restaurant. See the Waffle House Valentine’s Dinner page for a list of participating locations. This restaurant is offering its annual Valentine’s dinner with tableside service at select locations on Valentine’s Day. Seating is limited and reservations are required. Use the Open Table app or website to make a reservation.